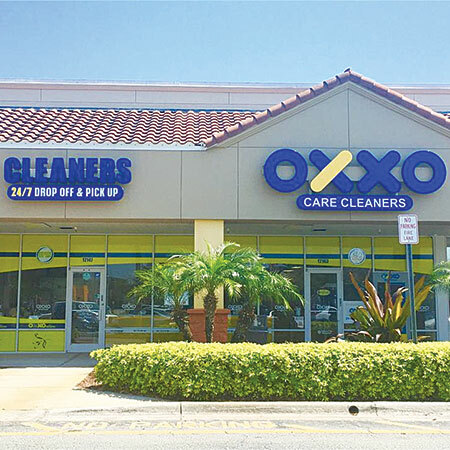 GreenEarth Affiliate OXXO continues to Flourish in Central Fla.
Boom and bloom for drycleaning franchise in Central Fla.
HOLLYWOOD, Fla. — Calling itself the “friendly garment cleaning franchise founded on the ‘We Care’ philosophy,” OXXO Care Cleaners has bloomed in the Orlando, Fla., area with three recent franchise store locations popping up, and a fourth on the way, it reports. The franchise writes that, “Orlando customers love the unique combination of services offered — 24/7 ATM pickup/drop off, boutique-style setting, mobile payment app, use of GreenEarth® Cleaning, and on-premises hand ironing,” it notes. The company’s Orlando-area expansion comes amid the metro area’s booming growth and popularity, the company says. For the last four years, it relates, the area has undergone a profound economic transformation, from its airport expansion to the luxury residential boom downtown. “We are confident that the personalized service and experience offered at our Orlando locations will continue to drive loyalty for our brand throughout the region,” notes Salomon Mishaan, CEO. Guillermo Gallegos, owner of the firm’s Clermont store location, near Orlando, brings business experience from the manufacturing and industrial sectors. He most recently owned a Home Depot-style store in Venezuela. His store serves the city’s northwest region. Also, the franchise will expand again, it notes, at the end of this year with the planned opening of another store, this time in Winter Park, another nearby suburb, to be run by franchisee Reny Balsa. Balsa feels that the city reflects the “anything is possible” mindset, as he calls it, “combining innovation and technology with a modern service that people today really need. People truly like the luxury drycleaning experience,” Balsa points out, and adds, “we’re very excited,” about the franchise opening its fourth area store.